La Grave is a truly unique ski resort in France that has a 12th Century village now linked to the huge Deux Alpes ski area. La Grave offers you to enjoy the truly awesome off-piste conditions and expert runs. La Grave is a spectacular and wild mountain area with a massive 2,150-metre vertical drop of the Vallons de la Meije, which can be accessed by a three-stage gondola. If you ski in La Grave the appropriate ski Lift Pass will allow you to ski or snowboard in the other Grande Galaxie ski resorts of Les Deux Alpes, Puy Saint Vincent and Serre Chevalier. La Grave is the best known European freeride skiing resort which attracts those who are looking for extreme skiing and boarding from all over the world. La Grave is an unpatrolled high mountain region and can be dangerous. Be aware that you should hire a guide to explore the full range of skiing in La Grave. Between Dome Lauze peak (3600) and the village of Romanche (1500), there are no marked runs – you create your own. That is an exciting and usually crowd-free area. Home to no more than about 500 permanent residents, La Grave is not a good choice if you're looking for nightclubs and active nightlife. Still, you will find a good selection of restaurants and a couple of bars. The Glaciers Bar and Les Vallons bar are most livelier places. Don't miss a chance to try some of the planet's most awesome off-piste skiing! Without a direct rail link to La Grave, the options for public transport are limited. You may find it easier to organise a direct resort transfer from your chosen arrival airport. You will benefit from a shorter journey time and a direct route. We scrupulously calculate all resort transfer services cost individually, to make sure that our customers never overpay. Whenever you choose to travel and whatever your final destination, Alps 2 Alps will get you there for the lowest possible price. However, we suggest that you pre-book your trip on time in order to get the best possible deal. Always keep up to date with Alps 2 Alps for the latest offers, deals and discounts on La Grave resort transfer services. All of the above mentioned will only ever result in our base-rate for ski transfers going down – we never over-inflate our prices at any time or for any reason. We also offer substantial discounts for off-peak, off-season and midweek transfers to La Grave. If you are searching for the best possible deals, travelling outside peak season or midweek typically results in the biggest savings. We offer midweek (Monday to Friday) prices with up to 60% discount than weekend prices. Your transfer quote will also depend on vehicle availability, transfer schedule, vehicle utilisation and other costs like road tolls and airport parking charges. From our side, we work hard to keep our prices low and are relentlessly committed to total value for money. Which is why we guarantee you the best price on your La Grave resort transfers, whatever your needs are. The resort of La Grave lies at an elevation of 1,450m, with a max vertical of 2,150m and its highest lift going as far as 3,550m. There are a total of 12 pistes and trails means approximately 12km of runs - the longest run in the French ski resort. La Grave Ski resort is excellent for expert skiers and snowboarding. That is worth to remember that La Grave is part of the Grande Galaxie Ski Area, with 530km of downhill pistes, 264 pistes and 151 ski lifts. The appropriate ski Lift Pass will allow you to ski or snowboard in the other Grande Galaxie ski resorts. La Grave ski resort will answer to everyone’s desires - children, teenagers or adults. For kids, there's a Snow Kindergarten ESF La Grave Piou Piou Club (French Ski School), located at the Chazelet. ESF ski instructors will teach your child the basics of skiing with the kindergarten mascots using fun and games (starting from 3 years old). 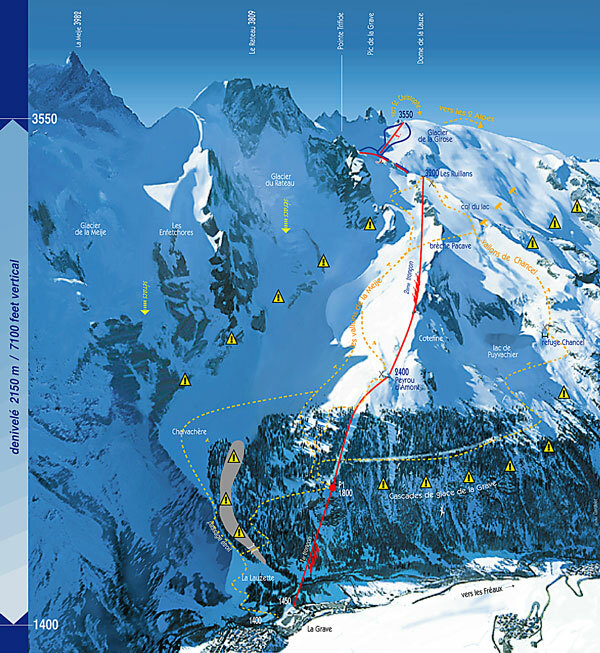 La Grave ski resort is close to the border with Italy and is an excellent skiing area. Off-piste runs make La Grave something of a mecca for the experienced skier and adrenaline seekers. Multiple hotels are providing accommodation in La Grave. The way we see it, La Grave resort transfers are about so much more than getting you to your final destination. After all, you also want to arrive comfortable, refreshed and ideally on time. Not all resort transfer services can promise this – Alps2Alps guarantees a higher-level service for every passenger. Keep an eye for the hot deals, discounts and special offers that could make your trip even more affordable. If looking to secure your seats for the best possible price, booking as early as possible is advisable. If you can’t find exactly what you’re looking for, please contact Alps2Alps customer service team today. Otherwise, proceed with your booking and we’ll see you in the snow!